Me and Morgan, in artsy black-and-white at the Gold Coast. It was 3 a.m. when Morgan Spurlock yelped, “You got a turkey! Gobble-gobble-gobble!” He was shouting this next to me but not at me. His fowl outburst was directed at John Corey, producer and director of Lost in the Fog, one of the better documentaries premiering this week at CineVegas. We were bowling, see, at Gold Coast. It was long past midnight. And Corey had just blasted all of the pins in the pit, thrice over. Spurlock does his Black Sabbath fan impression as John Corey (background) focuses on his game. “Gobble, man!” Spurlock reiterated as everyone high-fived. “You are the man!” Spurlock is of course the producer of the great documentary Super Size Me, the F/X series 30 Days and a member of the CineVegas Pioneers Documentary Awards jury. How this all started a study in how the celebrity dominos can topple here in VegasVille. Two weeks ago I saw Spurlock on The Late Show With David Letterman, a funny appearance in which he promoted the third season of 30 Days. Then, a few days ago, I bumped into him outside the bathroom at Brenden Theaters. Then at the kickoff party at Palms Place. Then at the unveiling of that oft-discussed Murakami video display at Lake of Dreams at Wynn Las Vegas. Then, finally, yesterday in the CineVegas Conde Nast Lounge, playing table tennis with his wife, Alexandra. “I’ll call lines!” I said to my new friend, Morgan Spurlock, who laughed because he has grown to appreciate my sense of humor and self-effacing manner. Anyhow, I made a plan shortly after that encounter that it would be fun to challenge Spurlock to a game of pool – there is a pool table in the lounge, too, but sadly, no shuffleboard – and have someone take a photo for posterity. But he took off and I thought it better I start spending my time at the festival actually working instead of stalking documentary filmmakers. The grim evidence of Game 3. Much later, a little past midnight, I again bumped into Spurlock at the CineVegas after-after party at the Gold Coast Bowling Center. I told him of my idea and asked if he was going to be around today to shoot pool. Nope, his commitment ended Wednesday as the jury wrapped up their documentary voting (no, I was not able to wrest any results from him), but he said, “Let’s bowl!” It was not quite the ragtag Big Lebowski crew, but our foursome consisted of me, Spurlock, Corey and CineVegas volunteer Jennifer Cochis, whose full-time job is assistant to the director of the Sundance Film Festival. Corey was easily the best bowler of the group; I later heard that he might be a closet bowler who actually owns talc. Me and Spurlock battled for second each game (he beat me two of three) and Jennifer took part just because it was “something different.” Near the end of the first game the center dropped the lights for “cosmic bowling,” which enlivened the entire assortment of sleep-deprived, beer-imbibed CineVegas types (a few lanes away, festival artistic director Trevor Groth sported a wild black wig while happily posing for photos). Trevor Groth, a man not easily embarrassed. Spurlock kept buying pitchers of beer and would offer to fill me a cup. “I don’t drink,” I kept saying. He persisted before I finally said, “I don’t drink, period. These cups of beer to me are like Big Macs to you.” He laughed – there was a lot of that – and he told me he hadn’t had a Big Mac or any McDonald’s food since March 2, 2003, when Super Size Me finished filming. “But I’ve had In-N-Out,” he said. “And my favorite, Tommy’s in L.A. I’m not above having a good hamburger.” Or some good fun. Spurlock’s last ball of the night was a sharp pickup of a one-pin spare (the 7). High fives, all around. 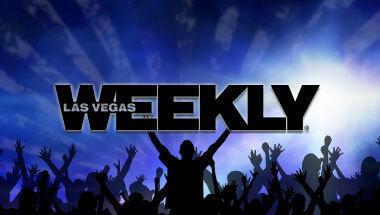 Las Vegas Weekly contributor Julie Seabaugh joins Josh to wrap up the 2009 CineVegas film festival, including award winners, local films and festival highlights. CineVegas 2009 wrapped up last night with girls on rollerskates, a drive-in and a filmmaker family reunion in the heart of Las Vegas.